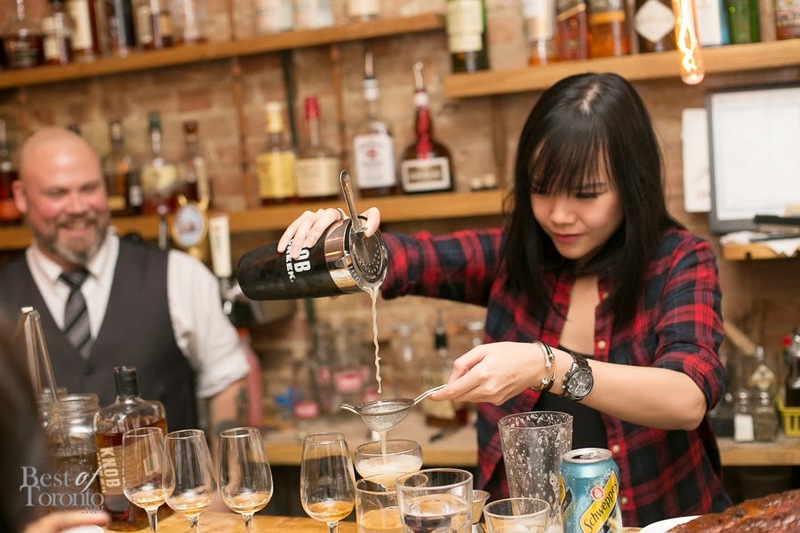 What do you do when you receive an email invitation to a Jim Beam® & Knob Creek® bourbon tasting? You immediately hit "Reply" and write back "Yes! I'll be there! Count me in!" Sounds too desperate? Maybe. But when it comes to bourbon tastings I'm more than willing to reschedule or cancel whatever is in the way. It's worth it. It's no trip to Kentucky but it's close enough in my book. Bourbon is one of my favourite types of American whiskies. It is, and always will be, America's Native Spirit - a spirit that the Beam family had a tremendous hand in helping create, foster and grow, both in the U.S. and globally, since 1795. After seven generations, Fred Noe, the great-grandson of Jim Beam and the company's Master Distiller, keeps the family tradition going and continues to perfect the world's number one selling premium bourbon portfolio. But it's all good 'cause once I sat down I was offered this delicious cocktail: smoked peach bourbon sweet tea with Knob Creek® bourbon. Think sweetened iced tea spiked with a smokey bourbon. Yep, how I wish all iced tea came this way. By the time I was halfway done my delicious "tea" the room was full! Guess it's time for some food. Paired with the bourbon sweet tea cocktail was a smoked duck breast finished with a Knob Creek® orange & coriander glaze and served with a side of pickled vegetables. After our appetizer, Matt Jones (@Whisky_Chef), Beam Suntory Canada’s Whisky Ambassador, led our whisky tasting. This bourbon dates back to 1796 when Master Distiller Basil Hayden Sr. created a recipe unlike any other - he used a traditional corn base but mixed in small grains in his mash to capture the spicy flavour of rye to complement the sweet smoothness of corn. Basil Hayden's® utilizes twice as much rye compared to other bourbons in the Collection. Aged eight years this bourbon had a brief finish and was the lightest out of the four. As bourbon ages, a portion of the liquid is lost from the barrel due to evaporation (the "angel's share"). After aging, when the bourbon is dumped out of the barrel, a certain amount of whisky is left trapped within the wood of every barrel, and that's the "devil's cut". Jim Beam® Devil's Cut® is made by recapturing the "devil's cut" and adding it back into the triple-aged six-year Jim Beam® Black Label Bourbon. It had a smooth yet strong smokey finish, and was my second favourite of the evening. Aged 9 years in deeply charred American oak barrels, the award winning Knob Creek® is handcrafted in limited quantities using time-honoured recipes. The result is a remarkably rich, sweet and full-bodied bourbon. The Knob Creek® Straight Bourbon was my favourite out of the four bourbons. 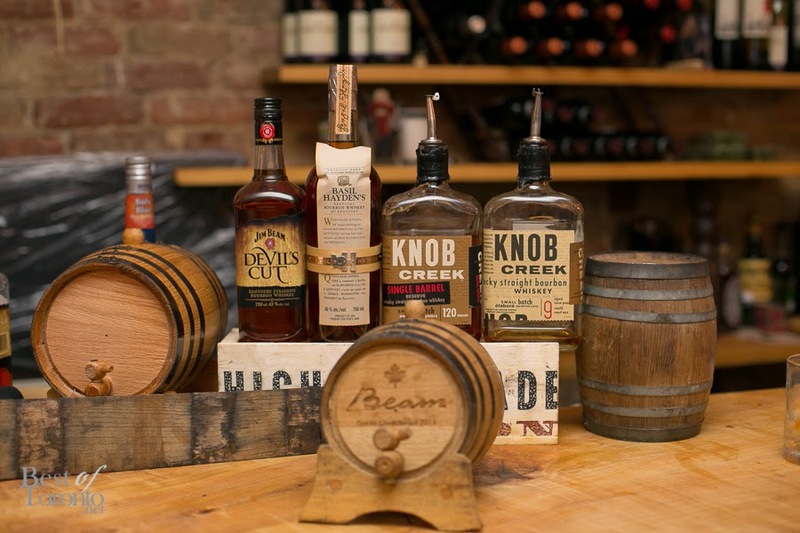 The barrels that become Knob Creek® Single Barrel Reserve are hand-selected by Fred Noe. Fred ensures that each barrel is harvested at the perfect timing, giving Knob Creek® Single Barrel Reserve its robust, mature flavour. I could taste vanilla and nuts, as well a slight smokiness (not as much as the Devil's Cut®) but at 60% alcohol, this bourbon was too strong for my taste. The Basil Hayden's®, Knob Creek® Straight Bourbon and Knob Creek® Single Barrel Reserve are all part of the Small Batch Collection. Formed by the perfect blending of art and science, bourbons from the Small Batch Collection are made from their own special, time honoured recipes - some dating back two centuries - providing distinctive aromas and tastes. After the tasting we had these smoked bacon-wrapped jalapeños that were stuffed with aged cheddar and served with a tomato dip. They were fiery hot, and it's the type of hot that lingers in your mouth and impairs your speech for the next five minutes. I still couldn't stop eating them though, they were oddly addictive. .Paired with the jalapeños was an Old Fashioned made with Knob Creek® bourbon. The star of the night (aside from the bourbons, of course) was this plate right here. The foodie in me was ecstatic when I saw fried chicken and ribs on the same plate. What you see here is sous vide buttermilk fried chicken, Peach & Basil Hayden mopped baby back ribs, served with cheddar corn bread and stewed collard greens. The fried chicken at Aft Bar is probably my favourite fried chicken in the city right now. Seasoned perfectly with a crunchy skin, the meat inside was juicy and moist. The skin, I must add, had the right thickness that I enjoy; it was not too thick nor too thin, so what you get is a crispy and crunchy skin (rather than just a thin crispy skin). The skin also doesn't fall off when you bite into the chicken; it remains intact with the meat (you know how with some fried chicken all the skin falls off after your first bite, leaving the rest of the chicken skin-less? I hate that.) The ribs, on the other hand, could have been a lot more moist and juicy. I also prefer saucier ribs. I finished the collard greens and corn bread, they were a delight with all that protein. My friend Nick, from Best of Toronto, caught me in action. Not too shabby, huh? Maybe I should quit my day job (or not). Hey, is Matt laughing at me? Gahhh. After making our own cocktails it was time to indulge in some dessert. This Knob Creek® Smoked Maple and Vanilla-infused pudding was rich, smooth and creamy. The candied pecans on top had a nice crunch. This heavenly dessert was paired with the Knob Creek® Smoked Maple bourbon, which had subtle maple and caramel notes. What an enjoyable evening of Kentucky bourbon whisky and - I'm not gonna lie - fried chicken!!! But seriously, I'm happy I had the chance to sample different Jim Beam® and Knob Creek® bourbons side by side, and finding out which ones I like best. Thank you to Matt Jones, Jim Beam®, Knob Creek®, Praxis PR and Aft Bar for putting together such a fantastic event.